Pioneers in the industry, we offer motor spindles and belt driven boring spindles from India. Capital Engg offers a wide range of Electroheads and Motorspindles for Metal & Composite Alloys machining. 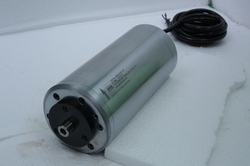 Manufactured by the thousand for a large number of applications, the quick-change liquid cooled Motor Spindle feature a vast range of powers and working speeds without foregoing high levels of reliability. Drive motors cover a very wide range used for finishing operations, to the heavy-duty applications; suitable rated torque ratios guarantee high machining precision and excellent performance. The Encoder communicates very easily with the Numerical Control to allow precise torque, speed and position control. Our range of belt driven boring spindles is a popular category of spindles used in numerous applications in different types of industries. They are designed to do boring in various materials and surfaces. In each and every boring machine tool spindle is the most important component responsible for its performance. 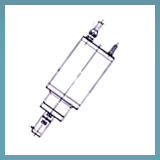 Boring spindles are designed for use in boring which implies the machining of an internal diameter in the work piece. Looking for Belt Driven Boring Spindles ?